Mats Forsberg blames the growing amounts of waste washing ashore on the Arctic archipelago on expanded fishing in nearby waters. “This is what I found during a short 200-meter walk along the shoreline of Sorgfjorden on the north coast of Spitsbergen,”Mats Forsberg tells the Barents Observer. Forsberg has been staff member on expedition ships in the Arctic longer than most others and has sailed around the islands at Svalbard tens of times. The changes are dramatic. “In the beginning, Svalbard was a pristine and beautiful wilderness. Today the archipelago has become a rubbish dump,” Mats Forsberg explains. Forsberg has a clear idea about where to put the finger of blame. Fishing is today allowed in the Hinlopen Strait, a passage 150 kilometers long and up to 60 kilometers wide between Spitsbergen and Nordaustlandet. Earlier, this strait was difficult to sail with fishing gear because of pack ice. Nowadays, like this summer, the ice is all gone. “It is actually sensational that it is still allowed to fish and trawl in the Hinlopen Strait. This is inside Nordaust-Svalbard Nature Reserve,” Forsberg says. Covering more than 55,000 square kilometers both on land and water, it is the largest preserved area in Norway. “Hinlopen is a fantastic marine area with genuine qualities, its important for polar bears, there are 5-6 larger locations for walrus, it’s a lot of whale, including blue whale, fin whale, mike whale and beluga whale,” Forsberg says and adds that the area also has important sea bird colonies. Forsberg is not primarily worried about how all the plastic garbage could negatively affect tourism with visitors sailing in on a growing number expedition ships. “It is the fishing industry itself that should be worried. 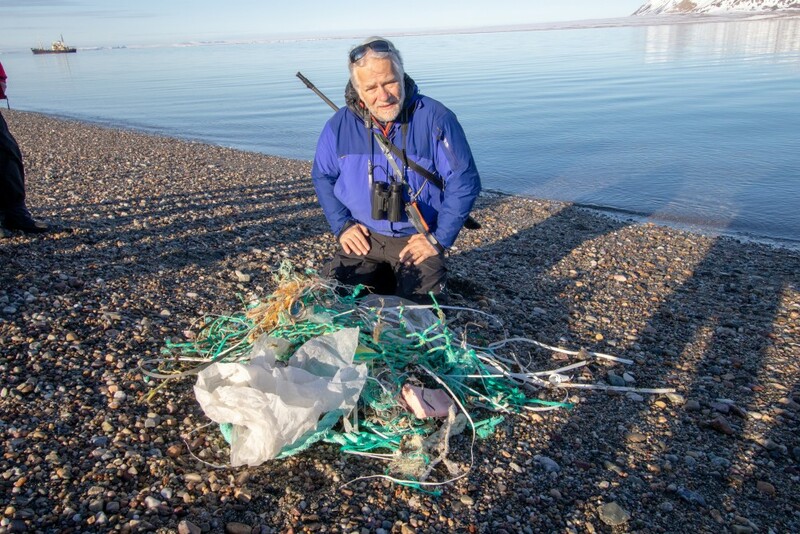 Plastic waste and pollution seriously damage the ecological system of the Arctic,” he says. This winter, the Norwegian Institute for Water Research (NIVA) published a report painting a grim picture of microplastics findings along the mainland coast to the Barents Sea. Here are the highest concentration of microplastics in blue mussels found anywhere along the coast of Norway. “What will be left 50 to 75 years from know when the oil is finished,” Forsberg asks.